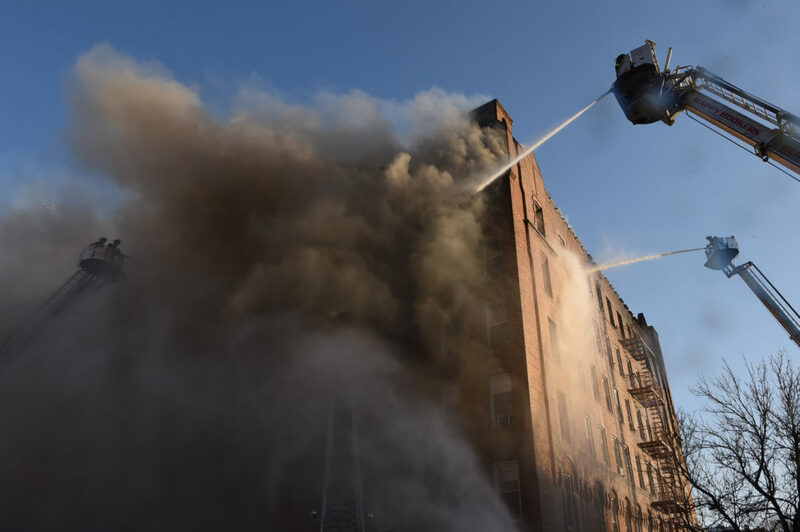 SUNSET PARK – A massive 6-alarm fire destroyed a Sunset Park apartment building Wednesday evening, injuring 23 people and leaving more than 100 residents homeless, fire officials said. Nineteen of the injured were firefighters with burns, smoke inhalation and other minor injuries. 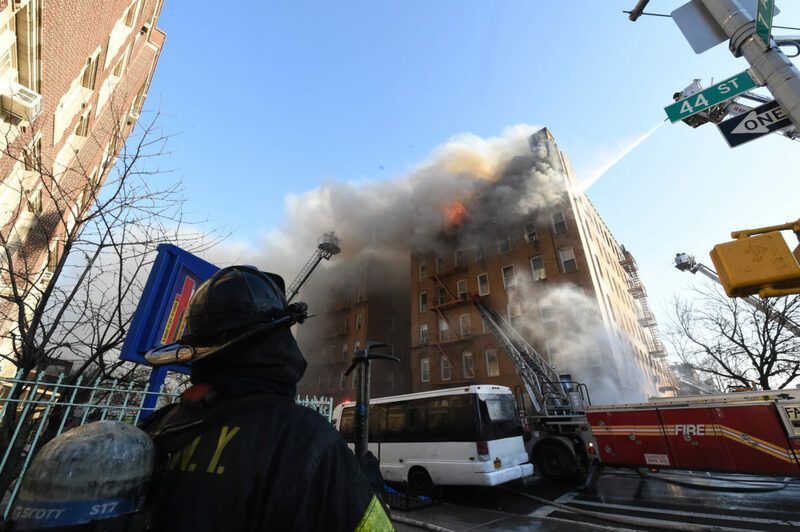 Four people were treated for smoke inhalation and shortness of breath, but none of the injuries was considered life-threatening, officials said. 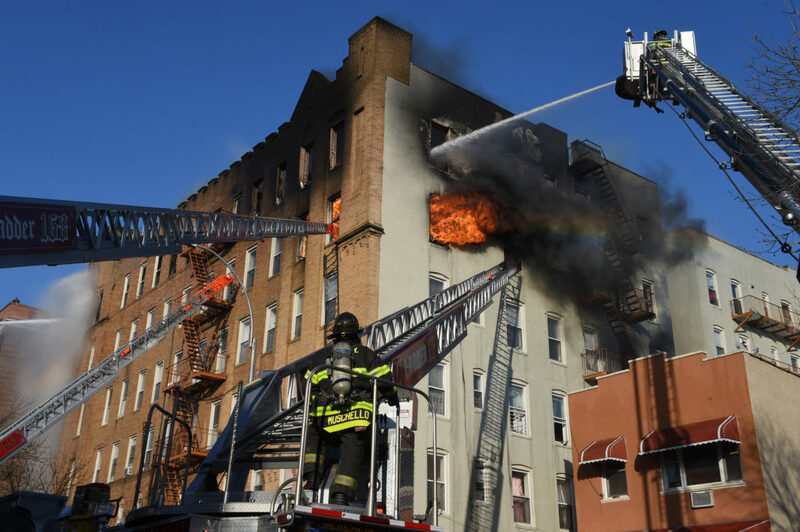 The fire was reported at about 4:30 p.m. in the fifth floor of 702 44th Street, a six-story H-type building that is split into two wings. 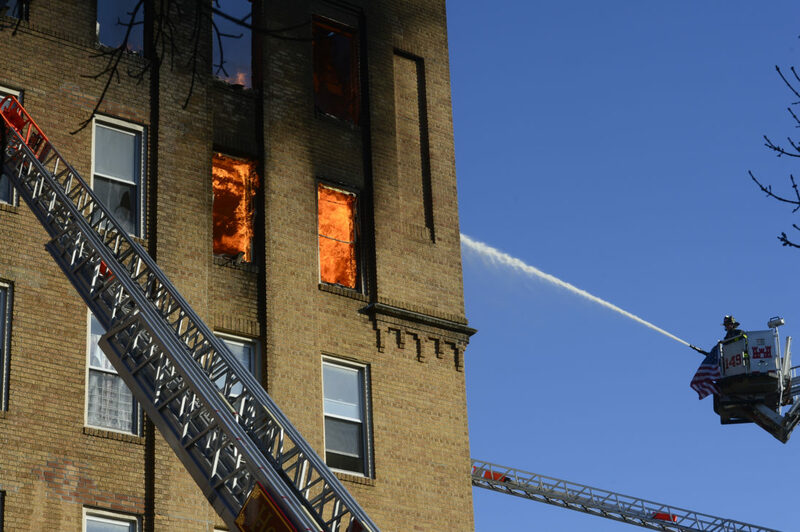 The first firefighters on the scene said they found fire in a closet of the fifth floor and others reported finding fire in the cockloft when they cut a hole in the roof to vent the fire. 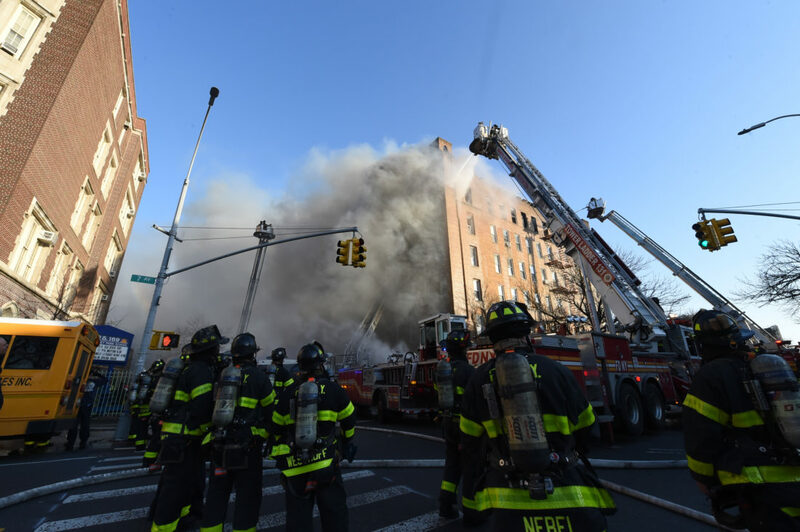 Numerous mayday alarms for firefighters were reported during the first minutes of the blaze, as firefighters found themselves surrounded by the fire. That’s because the fire had dropped down as low as the fourth floor and had spread into the roof, possibly from open shafts in between walls. A six-alarm fire ripped through 702 44th Street in Sunset Par last night. Todd Maisel/Bklyner.. 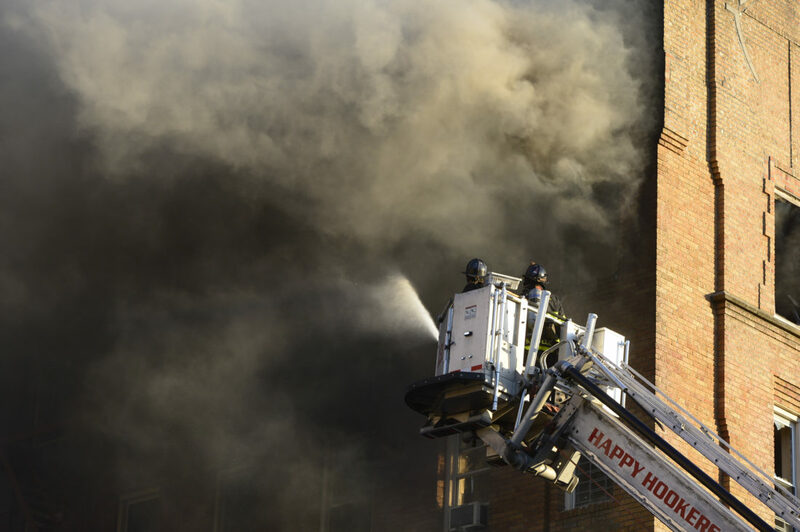 Firefighters quickly evacuated the roof when the found that the fire was blowing through numerous locations and they were too late to gain the upper hand. All firefighters did make it out without serious injury. Commander strategizes over how to put out the fire. “When we saw the fire in the roof, we knew it was time to get out of here,” one firefighter said. A six-alarm fire ripped through 702 44th Street in Sunset Par last night. Todd Maisel/Bklyner. 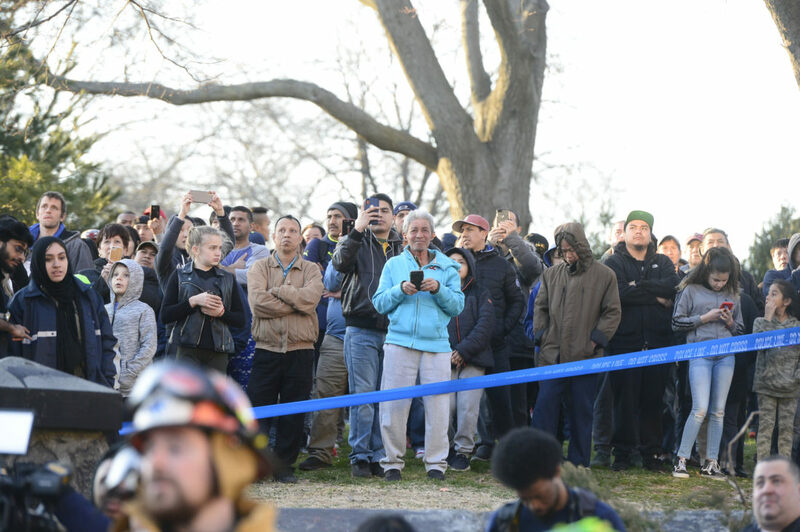 While some firefighters tried to control the spread of the fire, others were engaged in evacuating residents from their apartments. 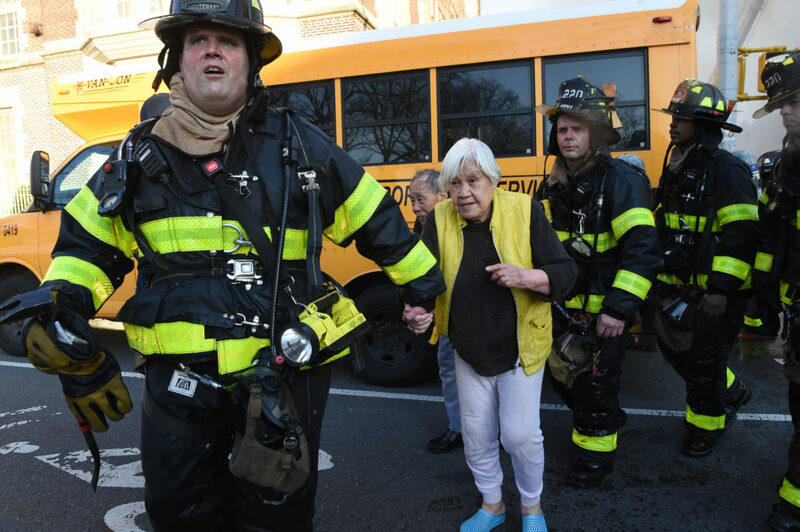 Firefighters led elderly residents and families with children to the street to safety as smoke filled hallways. Some residents braved the smoke to save pets that were in apartments. 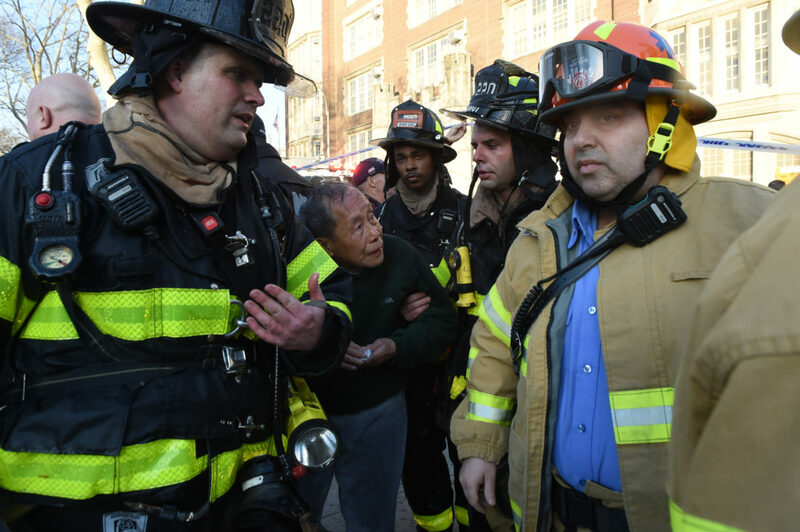 Elderly civilians were evacuated from the fire building by firefighters and would be treated for smoke inhalation. 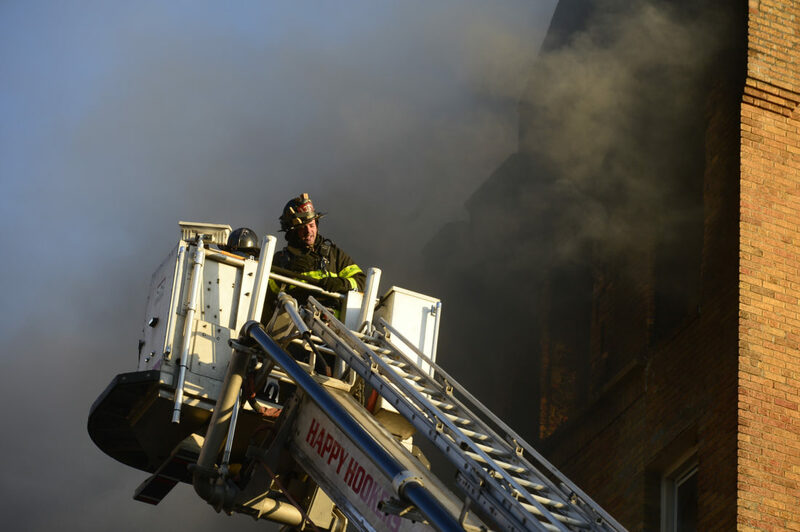 The fire continued well through the night with five tower ladders set up to pour water into the building from above. The Red Cross and the Office of Emergency Management were on the scene to help residents with relocation. The school across the street, PS 169, was open with children being led into the building from 43rd Street. 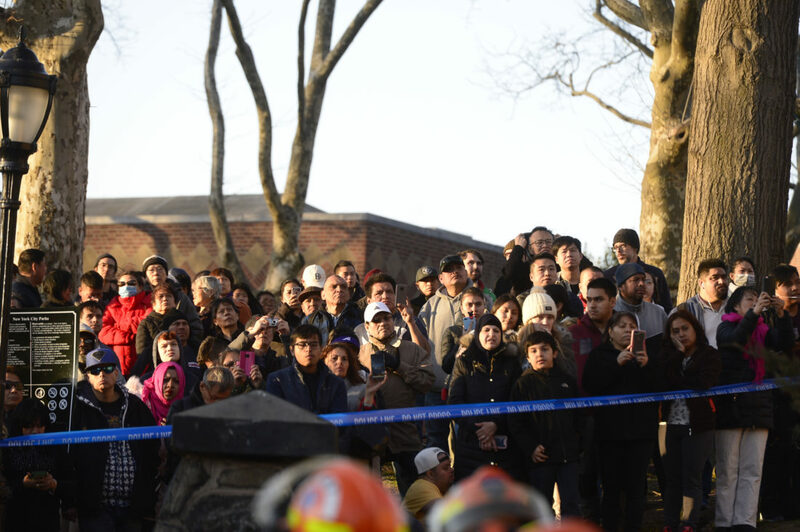 A collapse zone was also set up around the building as pieces of brick were falling from the façade after the fire and from the pressure of water hitting it from tower ladder hoses. 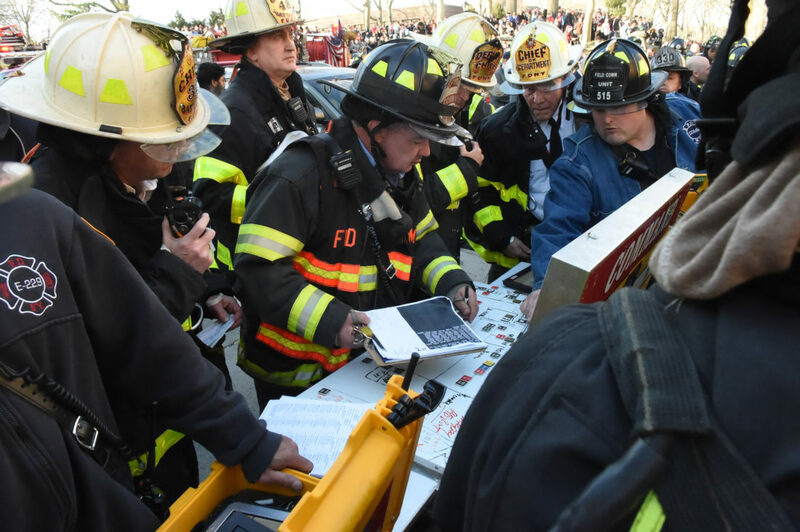 The cause of the fire was not immediately known and is under investigation by fire marshals and the NYPD Arson and Explosives Squad. 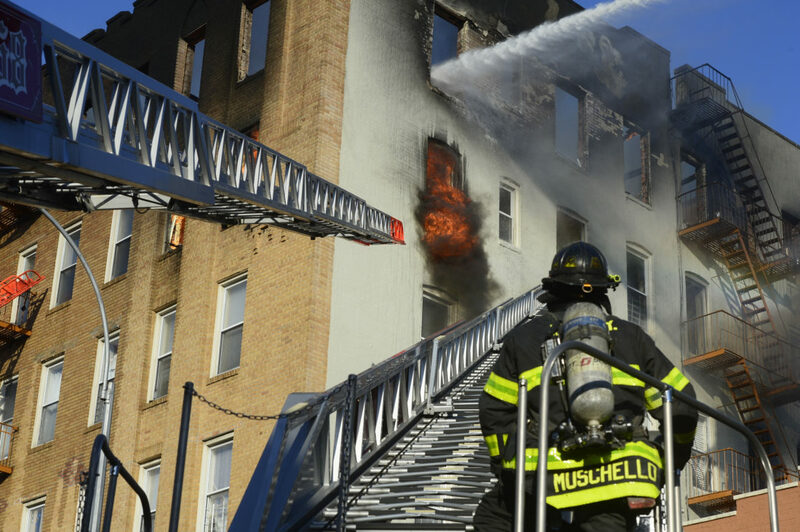 Firefighters recalled other fires that spread in similar ways and of similar difficulty including a multiple alarm fire at 3030 Emmons Avenue in Sheepshead Bay October 24, 2014 that killed two people and destroyed the large apartment building and one about four years ago on New York Avenue at Parkside Avenue in East Flatbush that remains vacant to this day. Todd Maisel is an award-winning photographer with more than 35-years, specializing in breaking news. 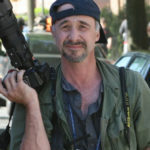 He currently serves as vice president of the New York Press Photographers. 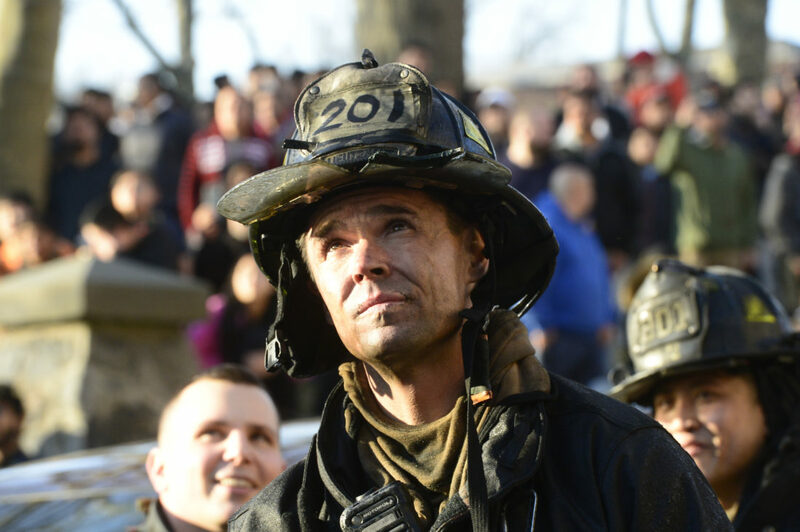 He was honored by the National Press Photographers Association and the Uniform Firefighters Association for saving the life of a firefighter he found in debris after the collapse of the World Trade Center, assisting in the rescue of an injured photographer, and for extensive coverage of the attack. Maisel is a graduate of NYU School of Journalism. OMG that’s scary. Thank you FDNY for saving lifes. My prayers to everybody. Where can we donate . They are good people with a charming dog named Leela.